The first contest with prizes ever held on the Ty.com website was the TyTrade Olympics Challenge. The Challenge began on September 09, 2000. The main purpose behind the contest was to introduce Ty.com visitors to the new TyTrade feature on the website and the Zodiac line of Beanies which were introduced August 19, 2000. 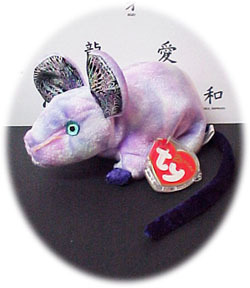 TyTrade was an auction board for buying and selling Beanie Babies. So what was the TyTrade Olympics Challenge? The contest was about the 2000 World Olympics that was held in Sydney, Australia. Visitors to the site had to correctly guess the amount of Gold, Silver and Bronze medals that the United States would take home! The contest was open for guess from September 9th - September 15th when the Olympics started. During the Olympic games the Ty.com website kept everyone up to date on the total medals won by the USA. Speckles the eBeanie even went to Sydney to report the Olympics live! Click here to read Speckles Reports of his Adventure in Sydney! 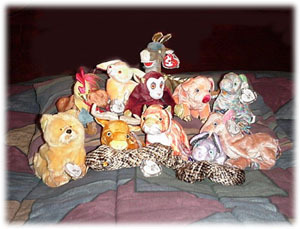 A set of all 12 Zodiac Beanie Babies. What makes these guys extremely special is that they are signed by Ty Warner himself! 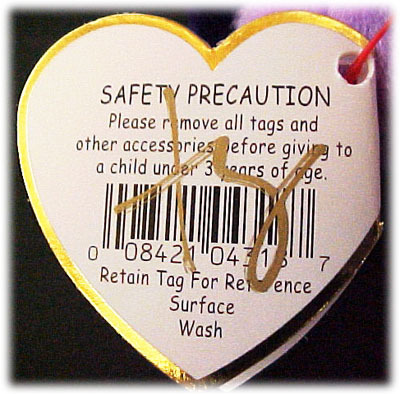 The backs of the Hang Tags were signed, most Ty signed Beanies are signed inside of the Hang tag across the poem! Thank you for participating in the Ty Trade Olympics Challenge. You may be the lucky winner of a complete set of Zodiac Beanie Babies autographed by Ty Warner himself! The 2000 Olympics ended on October 1, 2000 with the USA taking 39 Gold medals, 25 Silver medals, And 33 Bronze medals, with a total of 97 medals! The winner was Nicole Moran from Germany (They are a Military family from the USA stationed in Germany)! 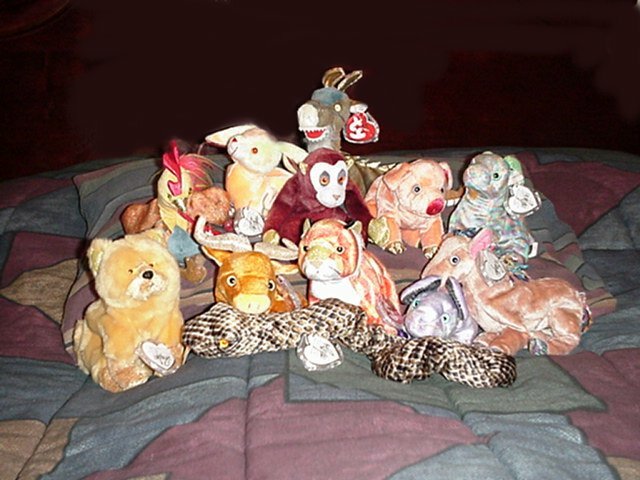 At the time of winning these 12 Zodiac Beanie Babies Nicole was just beginning to get into collecting and was still amazed that she had won! Click for a larger view! The above image was taken by Nicole the owner of the Beanies! A short time after winning all 12 Zodiac's Nicole desided to sell a few of them to help pay off some bills. I purchased from Nicole the Zodic Rat! Now one of my most prized Beanies! I thank Nicole greatly for giving me the chance to own something so rare! A one of a kind Beanie!